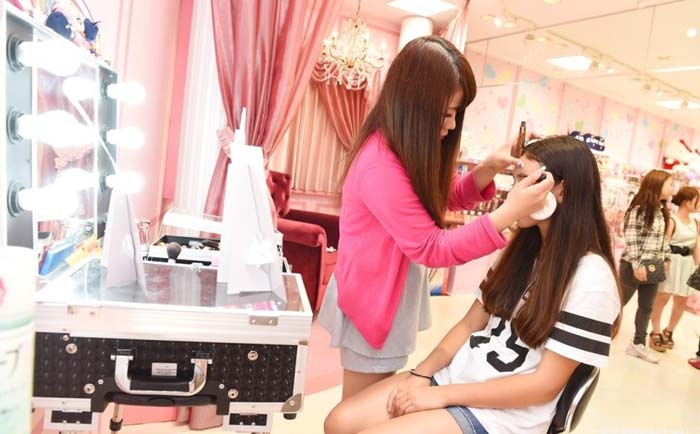 Girls of all ages enjoy the make-up experience at Yaese Hakkei Festival. Although we may still have a few cold days ahead, the spring is approaching fast, and on Sunday, Feb. 28, a spring festival called Yaese Hakkei Festival will be held at Kochinda Athletic Park gym. Organizers of the festival aim to combine “Yaese Iki-iki Walk” with “colorful Yaese food” giving people a chance to take a 3.6 or 6.5-kilometer brisk walk and then have fun sampling local gourmet foods and enjoying various workshops. 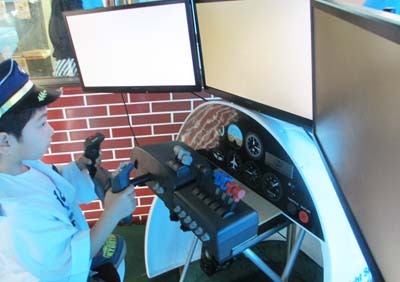 A simulator offers youngsters a chance to experience how its feels to land an aircraft. More than 20 local vendors will set up booths in the gym to organize sales and workshops while 16 more booths are outside serving meals made using ingredients grown in Yaese Town including “Yume Koubou” doughnuts and cakes. And local foods naturally taste best when eaten from locally made “Akamashibaru” plates and other pottery vessels. Although grown-ups could be happy with the food, perhaps their kids like more of the experience booths, where they can try to land an aircraft in a simulator or try their hand in real make-up. Those are among the attractions that the festival has arranged to entertain the younger visitors. On a stage in the back of the athletic gym a clown, local Eisa group and other performers entertain the audience with a non-stop flow of programs that end at 16:00 when the festival closes.